Rolling off the lot with a beautiful 2018 Hyundai Santa Fe Sport 2.0 Turbo thanks to my sales person Chris Davis he went above and beyond will definitely be back and send him referrals thanks a lot for your hard work and effort !!!! Thanks again World Hyundai Edin and Chris. I had an excellent experience with everyone, especially Eric. Everyone was extremely nice. I would come back again. 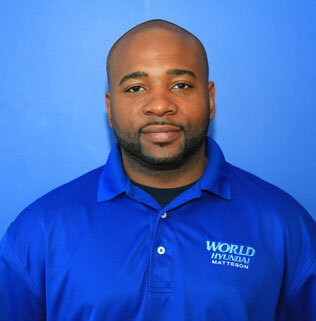 Antoine Ware was helpful and worked within his ability to fulfill his obligation of getting me into a new vehicle. Although it was not exactly the vehicle I was anticipating on getting but I feel it will work for me at this time. We are pleased to be your Crest Hill Hyundai Dealership. Thank you for your business.